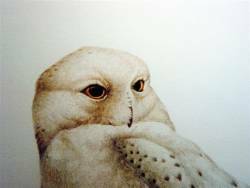 Birds of Prey - Owls Now you can own a signed limited edition print, (only 50 printed), by a successful Wildlife Artist using an original medium. At an affordable price! Shown as "Snowy Owl Head and shoulders" , in a acid free mount.Size of the print is 12" by 15"(38cm by 30.5cm) This is signed and numbered limited edition of 50 only.Printed to a very high resolution and standard, on superb quality paper with fast inks to guarantee total colour strength for at least 80 years under normal conditions. You will be very impressed with the price and the quality of this mounted print. THE SNOWY OWL (Nyctea scandiaca) was once known as the Great White. How it first became adapted to such climatic extremes still remains a mystery, but it can survive very low temperatures. The lowest recorded temperature is an amazing minus 93°C!! Great excitement was caused when the first Snowies bred in Britain this century in 1967. Now, the Shetlands site is occupied by only a few females after the disappearance of the male in 1975. Unless vagrant Snowies visit, the future of the bird in Britain is uncertain. Beauty has been a dangerous possession for the Snowy Owl. It has always been a trophy for greedy hunters who have found the owl easy to trap and shoot. Fortunately, the rare status of the Snowy in Britain has made it a valuable celebrity. DISTRIBUTION: Arctic. From the northern pack ice to the boreal forests to the south. HABITAT: Tundra and bare, rocky ground. HUNTING TECHNIQUE: Active at dawn and dusk. Still hunt from a perch or the ground, and hunt from the air. Similar to a Hawk in flight, approach prey with a long low glide. Frequently hover and even take prey from under the snow. PREY: Lemmings make up 90% of the diet in most places. Also rabbits, hares, seabirds, geese, grouse and other Birds of Prey. CONSERVATION STATUS: Widespread but vary locally from frequent to scarce. Relatively rare in Northern Europe. 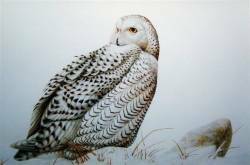 Image shown as "Snowy Owl on Tundra", in an acid free mount.Size of the print is 12" by 15"(38cm by 30.5cm)This is signed and numbered limited edition of 50 only. Printed to a very high resolution and standard,on superb quality paper with fast inks to guarantee totalcolour strength for at least 80 years under normal conditions.You will be very impressed with the price and the quality of this mounted print. "Little Owl on Branch", in an acid free mount.Size of the print is 12" by 15"(38cm by 30.5cm)This is signed and numbered limited edition of 50 only. Printed to a very high resolution and standard,on superb quality paper with fast inks to guarantee totalcolour strength for at least 80 years under normal conditions.You will be very impressed with the price and the quality of this mounted print. 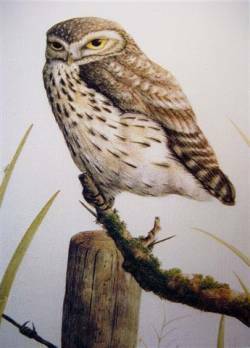 (Athene noctua) is the smallest of the British owls. It was once known as the Little Night Owl, Dutch, and French Owl. Originally a rare visitor to the British Isles, it is now native to this country after being introduced from the Continent in the late nineteenth century. Although the species has been successful, populations have declined recently as a result of road collisions, pesticide poisoning and habitat loss. The Little Owl is the true bird behind the phrase "wise old owl". This is because of its link with the goddess Athene who represented victory, fertility and divine wisdom. Though often seen by day, Little Owls hunt mostly at dusk. They are very sedentary birds despite their fierce appearance and most people cannot help but smile as the Little Owl comically bobs its head up and down in interest. DISTRIBUTION: Europe, North Africa, Middle East, Central and Eastern Asia. HABITAT: Open country, accessible woodland, parks, agricultural land and semi-desert. HUNTING TECHNIQUE: Suited to ground hunting. Long legs allow it to run, walk and hop fast. Partly diurnal, flies from post to post and launches onto prey. PREY: Rodents, invertebrates, birds the size of magpies and starlings. CONSERVATION STATUS: Widespread and locally common. British population 19,000 - 38,000 individuals.